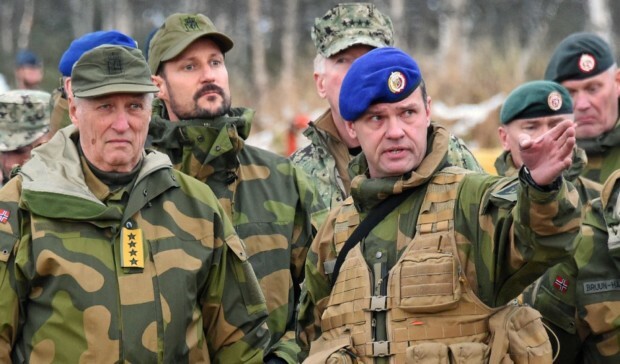 Image Caption: Norway’s king and crown prince visit NATO’s Trident Juncture exercise, the organization’s largest since 2002. As Yale students rushed to the sheltering indoors to escape the cold three weeks ago, many never imagined how NATO troops were conducting military exercises in more freezing temperatures on the other side of the Atlantic Ocean. On November 13th, NATO Trident Juncture 18 terminated the “Live Phase” of its operations, ceasing all military movements that involved a colossal amount of manpower and assets: 50,000 personnel, 250 aircrafts, 65 vessels and nearly 10,000 vehicles in the Scandinavian region. However, a majority of undergraduates at Yale College were unaware about the unfolding, significant events of Trident Juncture 18 – NATO’s largest exercise since 2002. When seven Yale undergraduates were asked about their opinions on NATO Trident Juncture on Nov. 7th, five declined offers to speak, citing their lack of knowledge on the topic. The other two added short commentaries on their analysis of the situation. One of the two, who wants to keep his name anonymous because of his affiliation to ROTC, simply stated that “All of the U.S Military are prepared to go to war with Russia if the Kremlin continues its threatening demeanor. These exercises are a way to show Russia that the U.S and its allies are prepared for anything thrown at them.” The student cited the military’s concern of Russia’s incursions into Crimea and instability near the Russia-Ukraine border. Indeed, the role of the U.S military in the exercise was greatest when comparing the collective resources pooled by other NATO states. According to the Pentagon, all primary branches of Department of Defense (Air Force, Navy, Army) participated in the exercise, totaling 14,000 U.S service members. A majority of the U.S force group in Trident Juncture derived from the Marine Corps, which served to emphasize the exercise’s priority on ground dominance for military officials and NATO representatives. The U.S Marine Corps sent its 24th Marine Expeditionary Unit with an array of vehicles for its logistical apparatus. In the NATO exercise, the Marine Corps saw its Wasp-Class USS Iwo Jima, an amphibious landing assault ship, transport troops and Light Armored Vehicles equipped with anti-tank missiles. The heavy allocation of Armor and emphasis on Infantry for the Marine Corp in unilateral operations in Iceland underline how the U.S and its allies view ground superiority as a key maneuver when facing a Russian invasion. One might ask why NATO invited observers from Moscow to watch Trident Juncture 18 if the exercise was to maintain operational security in case of Russian aggression. It seems that the central aims of NATO Secretary-General Jens Stoltenberg is to be transparent with NATO’s military capacity. NATO wants its determination to assemble defensive plans in anticipation of threats like Russian incursion to become public. In their campaign to draw attention to their stockpile of military resources, NATO has let media outlets enter exercise zones for coverage. Images of soldiers in cold-weather climate uniforms and display of new weapons like the hand-shouldered Carl Gustaf are purposefully distributed and widely uncensored for media proliferation. Yet NATO’s desire to inform the world about its strength comes as a double-edged sword. On one hand, nations sharing borders with Russia like Estonia are reassured by NATO about its resolve to protect its Eastern European members. For students like Alec Wallace ‘22, neutral nations, and political parties in the Nordic region, however, NATO’s actions resemble hawkish behavior that undermines the fragile peace that somewhat exists. Wallace mentioned that for him “I still feel like it’s an unnecessary demonstration of power to an extent.” He neglected to mention that Russian aggression prompted the exercises, but he elaborated on how NATO jumped to military solutions rather quickly. Talk between NATO and Russia have not been infrequent, but after the Crimean crisis, the two parties distanced themselves after each accused each other of violating the other’s affairs. While Trident Juncture 18 is primarily a demonstration of close cooperation with NATO and non-NATO partners like Sweden and Finland, the event has been characterized by Professor Graham of the Jackson Institute as a response to changing geopolitics. Professor Graham, co-Director of the Russian Studies Project at Yale and former two-term U.S Embassy official in Moscow, stated that NATO’s exercises could be an allusion to the new political questions brought by climate change. Professor Graham believes that NATO’s strategy with Trident Juncture is to legitimize Nordic NATO presence and contribute to an implicit condemnation of Russian military colonization of the Arctic. Upon evaluation, the three weeks of military exercises involved minor setbacks and incidents. For example, a participating Norwegian combat frigate Helge Ingstad purposefully ran aground as its hull became compromised after colliding with an oil tanker. In the exercise, a Russian SU-27 intercepted a U.S EP-3 Aries aircraft focused on surveillance over the Black Sea. Furthermore, new reports have emerged suggesting that Russia attempted to jam NATO GPS signals in Norway throughout the exercises. Despite Russian intentions to disrupt Trident Juncture, the success of the war games have empowered Stoltenberg and the Pentagon to acknowledge that such exercises may be a common occurence to serve several functionalities: deterrence and reassurance. When asked about futuristic policy shifts in the Kremlin, Professor Graham negated that Trident Juncture has completely swayed Moscow to renegotiate its grand strategy. He concluded that the exercises, if not, affirmed Moscow’s determination to oppose NATO. All eyes are now on Russia on their next move in their chess match against NATO in fighting for European influence.